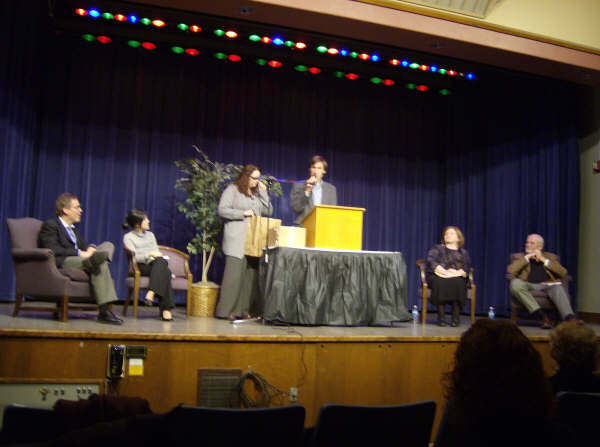 Each year Sycamore Review in conjunction with Purdue’s MFA program in creative writing holds a night of reading to raise money and collect canned food for a local food bank. This year’s event was especially successful: we raised over $400 and around 400 food items. This year’s readers were poets Mary Leader and Donald Platt (both teach in the MFA program at Purdue), memoirist and novelist Bich Minh Nguyen (whose interview appeared in issue 19.2) and guest speaker Donald Bain, author of the bestselling Murder, She Wrote series and the autobiography Murder He Wrote: A Successful Writer’s Life . Donald Bain is an alum of Purdue. 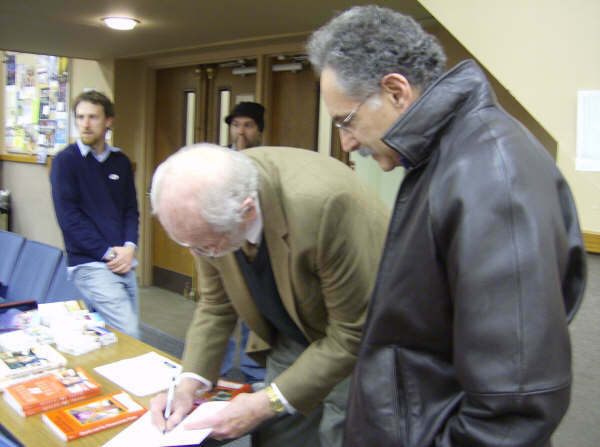 Irwin Weiser (Head of the English Department) getting his book signed by Donald Bain. Managing Editor Patrick Nevins (in Blue) and Editor-in-Chief, Mehdi Okasi (in the black hat). From Left to Right: Donald Platt, Bich Minh Nguyen, Daryll Lynne Evans (Assistant to the Director of Creative Writing), Dan Tyx (Looseleaf Coordinator), Mary Leader, and Donald Bain.